There was a surprise winner of this year's Vatican City state cup competition, the Coppa Sergio Valci, when Fortitudo 2007 defeated last year's winners Dirseco 4:3 on penalties after a 0:0 scoreline at the end of extra-time. 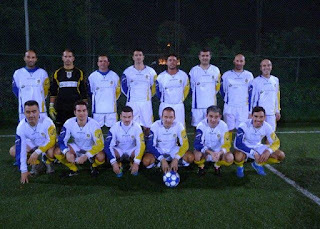 It was Fortitudo 2007's second-ever honour; they won the 1973 league championship under the name of Governarato. They finished third in the Vatican's 2012 league championship, seven points behind Dirseco. As mentioned in the previous article, five teams participated in the 2012 version of the Coppa Vaticano, which was renamed the Coppa Sergio Valci by the Attività Calcistica Dipendenti Vaticani (ACDV, which very loosely translates as the Vatican Employees' Football Activities, or the Vatican City FA) days after the death of the 79 year-old founder member of the organisation. The competition's first round comprised of a group where each of the teams played each other once. Guardia FC, representing the Swiss Guards, finished bottom and pointless. Fortitudo 2007 finished one place above Guardia, defeating them 5:1 to record their only victory - and points - in the group stage. New Hermes, Dirseco and Pantheon SD, who did not compete in the ACDV league championship last season, all finished in that order with 9 points. The top four teams progressed to the semi-finals, which were played over two legs. In semi-final and final play in the Coppa Sergio Valci, away goals do not count; instead the results over the two legs count, just like in the days before the away-goals rule was introduced. The ruling wasn't needed this time round; perhaps less than surprisingly, given that they won this year's league championship, Dirseco qualified for the final with a 3:1 aggregate win over Pantheon SD. What was rather unexpected was Fortitudo 2007's progress to the final after a dismal group stage; they overcame group winners New Hermes 4:1 on aggregate, thumping them 3:0 in the second leg. The final itself ended 0:0 after the regulation 90 minutes and was still scoreless after extra-time, which lasts for only 10 minutes under ACDV rules, but Fortitudo 2007 prevailed 4:3 on penalties to lift the newly-renamed Coppa Sergio Valci for the first time. Another reason for the Fortitudo 2007 team to feel cheerful was the fact that forward Fabrizio Gaudio topped the goalscorers' charts with 6 goals. All matches during the tournament were played at the Stadio Cardinale Spellman. Five players scored 2 goals apiece during the competition, while another 12 scored once. AUTHOR'S NOTE: Many thanks to the ACDV representative for their help in compiling this article.